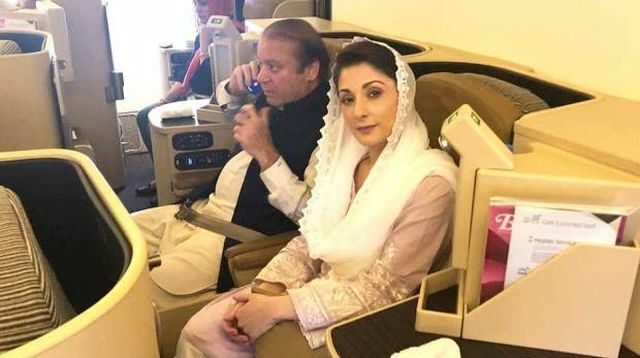 Lahore : Former Pakistan Prime Minister Nawaz Sharif and his daughter Maryam Nawaz were arrested by anti-corruption officials late on Friday after they arrived in Lahore from Abu Dhabi. The two were taken to Islamabad in a private plane. According to media reports, dozens of security officials entered the plane as it landed and asked other passengers to deboard. The passports of both Pakistan Muslim League-Nawaz (PML-N) leaders were seized by a three-member Federal Investigation Agency (FIA) team. Nawaz and Maryam were flown in a small private plane to Islamabad. Upon landing in Islamabad, the two would either be flown to Adiala Jail or driven to Attock Jail, the reports said. Nawaz and Maryam were convicted by an accountability court in the Avenfield corruption reference last Friday and handed jail sentences of 10 years and seven years, respectively. The former was found guilty of owning assets beyond known sources of income, while his daughter was convicted for aiding and abetting her father in covering up the “conspiracy”. After the pronouncement of the verdict, Nawaz and Maryam had said they would return to Pakistan and appeal against the decision. The National Accountability Bureau (NAB) and the Punjab government had made elaborate arrangements to take the father-daughter duo into custody upon arrival. In Lahore, authorities have braced to maintain law and order, as a large number of PML-N workers and supporters have gathered in various parts of the city to welcome the ousted Prime Minister and his daughter. Earlier, the father and daughter departed late from Abu Dhabi as their flight got delayed for over two hours. They had left London the previous day.